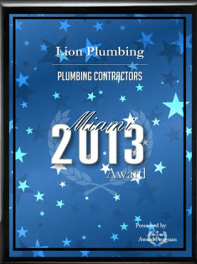 Our Services in Miami-Dade, Broward and Palm Beach | Lion Plumbing, Inc. Lion Plumbing Inc. is here to assist you with all of your plumbing needs in the Miami-Dade	and Broward areas. We have	more than 30 years of experience, and we are dedicated to providing you with outstanding service that goes	above and beyond your expectations. We work on sinks, faucets, tubs, showers, drains, toilets, garbage disposals,	and more! Also, some of our additional services include kitchen and bath	upgrades, and backflow preventer installation and certification. Read	the information below for additional details about some of our plumbing services. There isn’t a water heater system that we can’t repair, Install,	or replace. Make sure to reach out to our team as soon as possible when	you notice that your system is not functioning properly. Backflow Certification: What is a backflow preventer? A backflow preventer is an assembly that is used to protect potable water	supplies from contamination or pollution. “Backflow” is the	reversed flow of contaminated water (filled with debris, bacteria, etc.) into the potable water supply. If you want to prevent backflow from occurring,	it is essential that you certify your assembly annually. Florida law requires that all buildings and newly constructed homes install	and annually certify backflow preventers. At Lion Plumbing, Inc., we install,	certify, and repair all backflows and take care of all the paperwork with	the county. Save yourself the hassle by letting our professionals handle	the details! To schedule service with one of our Miami-Dade and Broward	plumbers, call us at (305) 597-4555.